Technique extemporanée d’allongement de moignon d’amputation tibiale proximale. A propos d’un cas. Introduction : Certaines fractures complexes peuvent aboutir à une amputation. Cette démarche entraine des conséquences majeures d’un point de vue fonctionnel. La réalisation d’une amputation du membre inférieur doit prendre en compte l’appareillage secondaire du patient. L’articulation du genou doit si possible être préservée, mais le moignon tibial doit être suffisamment long pour permettre un appareillage fonctionnellement satisfaisant. Matériel et méthodes : Nous avons pris en charge à J3, un homme de 29 ans, blessé dans une explosion. Il présentait un fracas proximal ouvert de jambe droite Stade III c de Gustillo Anderson. Sur le lieu de l’attentat, le traitement initial a consisté en un parage, la pose d’un fixateur externe et la réalisation d’un lambeau musculaire de gastrocnémien latéral. Les suites ont été marquées par un sepsis et une nécrose musculaire qui nous ont contraints à réaliser à réaliser une amputation transtibiale à J7. La fracture étant très proximale et pour permettre de conserver l’articulation du genou, seule alternative pour obtenir un appareillage fonctionnellement satisfaisant, nous avons réalisé une greffe du pilon tibial homolatéral. Cette autogreffe a été vissée sur l’épiphyse tibiale proximale et le tendon rotulien réinséré dans ce greffon par une ancre. Résultats : L’évolution a été favorable après thérapie par pression négative puis greffe de peau. La cicatrisation a été finalement obtenue après un épisode fistuleux qui a nécessité une reprise du moignon osseux. Puis le patient a pu être appareillé dans de bonnes conditions. Discussion : L’amputation en cuisse est très péjorative en termes d’appareillage et d’avenir fonctionnel, notamment chez les patients jeunes. Cette technique originale de rallongement permet de conserver un capital osseux satisfaisant pour la conception d’une prothèse adaptée. Elle est réalisable à condition de pouvoir recouvrir le moignon avec un lambeau musculaire restant de bonne qualité et que le tendon rotulien soit réinséré. Conclusion : Cette technique expérimentale a donné un bon résultat fonctionnel chez ce patient qui présentait les conditions pour en bénéficier. Shoulder loading reliability in seated able-bodied subjects. Ballas R, Peyrot N, Allard P, Caderby T, Edouard P, Dalleau G.
Shoulder performance and sensorimotor control assessments help to identify shoulder instabilities and document the rehabilitation progress. Testing seated subjects in a position of hand prehension requires less controlled adjustments to maintain body balance in a clinically relevant situation. The objective of this work was to determine the test-retest repeatability of a novel shoulder stability test in seated subjects with the ipsi-lateral hand in prehension during four arm loading conditions. Able-bodied subjects were seated on a rigid chair fixed to a force plate. A horizontally and posteriorly directed force was applied to the hand for four 4 loading conditions ranging from 0 to 3?kg. Ten postural balance parameters were calculated from the center of pressure displacements and its corresponding free moments. Intra-class correlation coefficients were calculated for three consecutive trials and for four loading conditions. Generally, the intra-class correlations values increased gradually with the load and varied from 0.727 to 0.948. Tz values increased non-linearly with the applied load. The test-retest reliability of a new shoulder stability test in seated able-bodied subjects was high with sufficient loading (3?kg) and 3 trials. Bon E, Balleydier E, Mathieu I, Picot S, Jaubert J, Ballas R, Colomb-Cotinat M, Tristan A, Bouchiat C, Filleul L, Pagès F.
The emergence of community-associated methicillin- resistant Staphylococcus aureus (CA-MRSA) including strains that harbour the Panton-Valentine leukocidin (PVL+) is a challenge for health practitioners especially in high risk communities like sailors [1, 2]. In November 2014, a possible cluster of CA-MRSA skin and soft tissue infections (SSTIs) due to a persistent circulation of a PVL+ strain (CC30-MRSA-IV PVL+ southwest Pacific clone) was signalled on a civilian ship in Reunion Island. First isolated in 2012 colonising a sailor with numerous episodes of SSTIs, this clone was again found in 2014 colonising another sailor. A retrospective analysis of the board medical register showed that SSTIs have occurred regularly during this period but unfortunately no clinical isolates have been collected to confirm a possible outbreak. In February 2015, a field investigation and a screening campaign were organised on board. A form recapitulating the occurrence of suppurative skin lesions during the 3 years was administered to crew members and nasal swabs were collected. Inform consent was obtained from each volunteer. Positive cultures for Staphylococcus aureus were sent to the French national reference centre for staphylococci (CNR-staph), Lyon for antimicrobial susceptibility testing and molecular characterisation [3, 4]. Cutaneous infections cases were then classified in four categories: 1) Possible case: recurrent minimal skin infections (impetigo, folliculitis) without bacteriological sample; 2) Probable case: suppurative primitive skin infections requiring surgical drainage or with spontaneous fistula of a large amount of pus without bacteriological sample (clinical site or colonisation); 3) Confirmed case: probable case with a bacteriological identification of a MRSA (clinical site or colonisation); 4) Other infected skin lesions: sores, herpes, sebaceous cysts, etc. Thirty one patients with one episode or more of infectious skin disease were identified from 2012 to 2014 (Fig. 1). Four patients were excluded. Among the remaining, 2 were considered as confirmed cases, 20 as probable cases and 5 as possible cases representing 54% of crew members. During the interviews, 12 (24%) sailors declared suffering recurrent suppurative skin infections during the study period. Out of the 50 crew members, 47 (94%) agreed to participate in the study. Seventeen (34%) subjects carried methicillin- susceptible Staphylococcus aureus (MSSA) without PVL toxin and one was colonised by a MSSA PVL+ belonging to the CC152-MSSA-PVL+ clone. However no www.intmarhealth.pl 71 Etienne Bon et al., Panton-Valentine leukocidin-positive MRSA on board other colonisation by the CC30-MRSA-IV PVL+ southwest Pacific clone has been found, we cannot rule out that in the past a cluster of SSTIs has occurred due to this clone on board but without bacteriological exploration of the lesions, it is impossible to conclude. In our study, 50% of crew members have presented cutaneous infections clinically compatible with SSTI from 2012 to 2014. To be able to detect a possible outbreak in the future, it was recommended to systematically take a sample of all skin lesions on board and to collect the swabs until the arrival in port. Since 2015, this procedure is used on board and if sporadic infections by MSSA PVL+ or SARM PVL+ have been reported, none outbreak has been identified. Bacteriological documentation of cutaneous infection is essential in high risk communities to rule out the circulation of virulent strains and to implement if necessary specific control measures . Clinical features of 27 shark attack cases on La Réunion Island. Ballas R, Saetta G, Peuchot C, Elkienbaum P, Poinsot E.
AbstractBACKGROUND:Between January 2000 and September 2016, there have been 27 documented shark attacks on La Réunion Island. The insular nature of La Réunion has allowed us to perform an extensive survey of these attacks. The objective was to describe the clinical features of these shark attacks, as only case reports have been published up to now.METHODS:This was a retrospective observational study of the 27 cases of nonprovoked shark attacks that have occurred between January 2000 and September 2016. Post-humate predation, provoked attacks, and isolated attack on devices were excluded. All bone and vascular injuries were documented in the 21 remaining cases. Prehospital tourniquet use was specifically recorded.RESULTS:Among the 21 victims, eight died (38%) despite rapid use of resuscitation techniques in five cases when it was feasible; these techniques were not needed in the survivors. 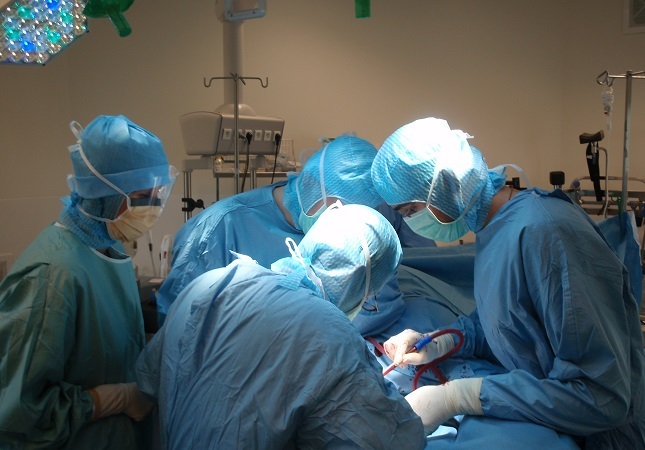 Thirteen patients were immediately treated in the operating room. Amputation or disarticulation occurred 13 times in 10 victims, five of whom died. Twelve injuries to major vascular structures were found in 11 victims, six of which died. A prehospital tourniquet was applied in four of the five surviving victims who had injuries to major vascular structures (including one victim with major humeral and femoral artery damage) and in one victim who died (the very proximal wound was not controlled).CONCLUSION:Our study found that quickly applying a tourniquet to the injured limb(s) contributes to the victim's survival. Disarticulation is a particular feature of shark attacks. The number and severity of shark attacks at La Réunion Island are worse than in the rest of the world.LEVEL OF EVIDENCE:Epidemiological, level V.
Fourteen years follow-up of massive pelvic girdle osteolysis caused by lymphatic malformation (Gorham-Stout Disease). This radiograph reveals an osteolysis of the right pubic bone, theleft obturator ring, the sacrum and the greater trochanter of the right femur (Fig. 1). The patient was a 46-years-old woman with a 14-years evolution of a lymphatic malformation: Gorham-Stout disease [1,2]. Thoraco-abdomino-pelvic imaging did not reveal further irregularities. Blood tests did not reveal any anomalies such as inflammation or a dysregulation of phosphocalcic homeostasis. The protein electrophoresis, renal function and thyroid hormone were normal and no tumor markers were detected. Urg' Pédiatrie - Toutes les situations d'urgence pédiatrique en poche ! Que ce soit aux urgences, dans les services d'hospitalisation, en SMUR ou même au cabinet, l'urgence pédiatrique est source de stress et d'interrogations. Un grand nombre de pathologies sont spécifiques à l'enfant. L'abord de ce jeune patient et son examen clinique mais aussi les gestes techniques sont très particuliers. Et les recommandations officielles ont été nombreuses ces dernières années en pédiatrie.Urg' Pédiatrie n'est pas un traité de réanimation pédiatrique ; il a été rédigé par des urgentistes et conçu de façon pragmatique pour apporter les réponses médicales adaptées à la quasi-totalité des situations pédiatriques auxquelles le médecin doit faire face. Ce mémento de l'urgence médicale et chirurgicale pédiatrique offre des orientations diagnostiques à partir des principaux motifs de consultation et aborde les pathologies à la fois sur le plan du raisonnement clinique et sur le plan thérapeutique.Entre autres outils pratiques (principaux médicaments de l'urgence, formules, scores et échelles utiles, constantes pédiatriques), il propose en outre des procédures de reconstitution des médicaments injectables, ce qui est totalement inédit. Ouvrage résolument fonctionnel et didactique, URG' Pédiatrie est un outil "de terrain" pour tous les acteurs pré-hospitaliers et hospitaliers de l'urgence pédiatrique.Cette nouvelle édition s'inscrit comme une référence indispensable pour les médecins urgentistes, réanimateurs pédiatriques ou pédiatres, de même que pour les médecins généralistes confrontés aux situations urgentes chez l'enfant. Ground-reactive forces after hallux valgus surgery: comparison of Scarf osteotomy and arthrodesis of the first metatarsophalangeal joint. AIMS:The purpose of this study was to analyse the biomechanics of walking, through the ground reaction forces (GRF) measured, after first metatarsal osteotomy or metatarsophalangeal joint (MTP) arthrodesis.PATIENTS AND METHODS:A total of 19 patients underwent a Scarf osteotomy (50.3 years, standard deviation (sd) 12.3) and 18 underwent an arthrodesis (56.2 years, sd 6.5). Clinical and radiographical data as well as the American Orthopaedic Foot and Ankle Society (AOFAS) scores were determined. GRF were measured using an instrumented treadmill. A two-way model of analysis of variance (ANOVA) was used to determine the effects of surgery on biomechanical parameters of walking, particularly propulsion.RESULTS:Epidemiological, radiographical and clinical data were comparable in the two groups and better restoration of propulsive function was found after osteotomy as shown by ANOVA (two way: surgery × foot) with a surgery effect on vertical forces (p < 0.01) and a foot effect on anteroposterior impulse (p = 0.01).CONCLUSION:Patients who underwent Scarf osteotomy had a gait pattern similar to that of their non-operated foot, whereas those who underwent arthrodesis of the first (metatarsophalangeal) MTP joint did not totally recover the propulsive forces of the forefoot.TAKE HOME MESSAGE:The main findings of this study were that after surgical correction for hallux valgus, patients who underwent scarf osteotomy had a gait pattern similar to that of their non-operated foot in terms of forefoot propulsive forces (Fz3, Iy2), whereas those who underwent arthrodesis of the first MTP joint had not. Cite this article: Bone Joint J 2016;98-B:641-6. Anterior glenohumeral joint stabilization in tetraplegic patients by medializing the anterior head of deltoid muscle. Ballas R, Fattal C, Teissier J.
Alhomsi F., Humeau J., Marchaland JP., Djaknikpo G.
Les auteurs décrivent un cas exceptionnel de décollement épiphysaire des 2 olécrânes chez un enfant de 14 ans. Alhomsi F., Humeau J., Marchaland JP., Pourjamasb B.
L’entorse de cheville passe parfois inaperçue ou est fréquemment négligée par le patient voire le praticien, malgré l’enseignement et les recommandations consensuelles des sociétés savantes et des chirurgiens orthopédistes. Cette pathologie trop souvent considérée comme bénigne souffre de séquelles dans 20 à 40% de cas malgré un traitementfonctionnel bien conduit : elles sont représentées principalement par l’instabilité chronique avec récidives d’entorse, les séquelles douloureuses avec le conflit mécanique cicatriciel (« impingement syndrome ») et les lésions ostéochondrales du dôme talien. Results of a stemless reverse shoulder prosthesis at more than 58 months mean without loosening. Computer-assisted total knee arthroplasty: impact of the surgeon's experience on the component placement. Ballas R, Philippot R, Cartier JL, Boyer B, Farizon F.
Endopelvic migration of a sternoclavicular K-wire. Case report and review of literature. We report a unique case, never before published, of sternoclavicular joint fixation K-wire migration to the pelvic region, in a 56 year-old man. Two years previously, sternoclavicular dislocation had been fixed by three wires. A transitory episode of precordial thoracic pain followed by iterative abdominal pain accompanied the migration. Extraction was performed five years later. Scapular K-wire migration is frequent. The proximity of cardiovascular structures may have fatal consequences. This type of internal fixation raises questions, and migration prevention needs to be taken into account. Medical complications and the legal context are major factors leading us to abandon this type of osteosynthesis. Once migration has been diagnosed, the wire should be removed without delay. Migration endopelvienne d’une broche de fixation sternoclaviculaire. Cas clinique et revue de la littérature. Nous rapportons un cas unique, jamais publié auparavant, de migration d’une broche d’ostéosynthèse sternoclaviculaire vers la région pelvienne chez un patient de 56 ans. Une luxation sternoclaviculaire avait été fixée par trois broches deux années auparavant. Un épisode transitoire de douleur thoracique préchordiale, puis des douleurs abdominales répétées ont émaillé le cheminement de La broche. L’extraction a été effectuée cinq ans plus tard. Les cas de migrations de broches de la région scapulaire sont fréquents. La proximité des structures cardiovasculaires peut entraîner des issues fatales. La mise en place de ce type d’ostéosynthèse doit être remise en cause et la prévention de leurs migrations prise en compte. Les complications médicales et le contexte médicolégal jouent un rôle majeur et nous poussent à exclure ce moyen d’ostéosynthèse. O. BARBIER, D.OLLAT, JP MARCHALAND, G. VERSIER. Cette étude rétrospective porte sur de 8 cas de traitement d’instabilité postérieure chronique de l’épaule chez 8 patients (8 hommes), d’un âge moyen de 27 ans (25 à 34 ans). Le traitement utilisé a été la butée iliaque postérieure par voie d’abord trans-musculaire dissociant le muscle sous épineux associée à une désinsertion du faisceau postérieur du deltoïde. 5 cas étaient d’origine post-traumatique, 2 cas étaient liés à une hyper laxité constitutionnelle et 1 cas était secondaire à une crise comitiale. En préopératoire, les patients se plaignaient d’une instabilité postérieure post-traumatique dont 4 cas de luxations récidivantes et 4 cas de subluxations, parfois douloureuses. Chez tous les patients, l’imagerie a retrouvé des lésions de passage à type d’encoche de la tête humérale de Mc Laughin et d’une fracture ou un éculement de la glène postérieure. A la révision, 2 patients avaient été repris pour des douleurs persistantes l’un pour des douleurs liées à des vis trop longues, l’autre pour une désinsertion du faisceau postérieur du deltoïde. Aucun déficit du nerf sus scapulaire n’a été constaté. Tous les patients ont retrouvés des mobilités articulaires normales. 4 patients seulement ont retrouvé leur niveau sportif antérieur. L’imagerie de contrôle (radios de face RN, RI, RE et TDM) a recherché en vain une pseudarthrose ou une lyse de la butée et la présence d’une arthrose gléno-humérale précoce. Au total avec un recul moyen de 4 ans, notre série rapporte un résultat satisfaisant dans 80 % des cas. La revue de la littérature retrouve des résultats similaires avec une récupération souvent quasi-complète des amplitudes articulaires et un retour à un niveau sportif antérieur dans 50% des cas. Aucune récidive d’instabilité n’est rapportée avec cette technique qui comporte comme principale difficulté le réglage du positionnement de la butée. La butée postérieure par greffon iliaque confirme ainsi son efficacité, son faible caractère arthrogène à moyen terme avec des résultats encourageants. How to Cover Soft-Tissue Defects After Injuries to the Leg in Precarious Conditions. Marchaland JP, Ollat D, Mathieu L, Versier G.
In precarious conditions, bone exposure on the leg is synonymous with amputation. The authors describe their experiences with such injuries in 15 patients. Fifteen patients were operated by the same surgeon in Afghanistan and Ivory Coast for bone exposure on the leg after war or roadcrash injuries. A flap was performed after an initial debridement and external fixation. The delay between the flap and the first injury was about 42 days. The duration of hospitalization following the flap was about eight days. Cicatrization was complete after 25 days. Three patients had complications: one partial necrosis of the skin, one sepsis, and one patient had a leg amputation. In precarious conditions, the management of bone exposure in local civilians and soldiers is limited by the conditions in their country or the conditions at the field hospital. The treatment must be simple and reliable because it may be difficult to perform patient follow-up. A pedicled flap provides new vascularized tissue with anti-infectious properties. Classical indications are: muscular flaps for the proximal and the middle part of the leg; sural flaps for the middle and the distal-third part. In substantial soft-tissue defects, amputation must be discussed. The pedicled flap is an essential technique for fighting against infection, especially in cases where only poor technical and medicinal resources are available. This simple and reliable technique allows most tissue defects on the leg to be covered. Qualité de l’information médicale sur Internet : que faut-il en penser ? Que répondre aux interrogations de vos patients ? Internet est devenu un outil incontournable dans la diffusion d’informations. Il est de plus en plus utilisé par les patients pour se renseigner. Malheureusement, la diffusion de l’information sur le Web n’obéit quasiment à aucun contrôle. Dans ce contexte, il est de plus en plus difficile de discerner une information médicale de qualité parmi la multitude de données en circulation. Différentes initiatives sont ainsi apparues pour essayer de trouver des critères témoignant de la qualité d’une information médicale et labelliser les sites la diffusant. C’est notamment le cas de la charte HON (huit critères) proposée par une ONG suisse et reprise par l’Haute Autorité de santé. Les critères essentiels sont : l’identité et la fonction de l’auteur, le but de sa communication, la « fraîcheur » de l’information (date de création et mise à jour), les modes de financement du site (place de la publicité), la présence d’un contrôle (comité éditorial, webmestre) et le respect des règles médicolégales et déontologiques. Nous proposons donc de faire la synthèse de ces notions utiles à connaître pour choisir une information de qualité sur le Net. Le chirurgien pourra ainsi aborder sereinement ce sujet avec ses patients et mieux les conseiller dans leur recherche afin de leur éviter tout jugement erroné bâti sur des informations de mauvaise qualité ou mal assimilées. Introduction.—No study, so far in France, has investigated the diagnosis value of knee MR arthrography since the recent approval of intra-articular gadolinium use, by this country’s healthcare authorities. This study objective is to verify the MR-arthrography superiority on conventional knee MRI, in meniscus and cartilage knee lesions diagnosing accuracy both in regard to sensitivity and specificity. Hypothesis.—MR-arthrography, represents in some pathologic situations, a more accurate source of information than conventional MRI. Materials and methods.—Over a 27 months period, 25 patients, scheduled to undergo a knee arthroscopy volunteered, after having been fully informed of the possible interest and risk of the MR-arthrography examination, to participate in this study. Twenty-one of them were finally included since in four cases the surgical indication was not confirmed. The group consisted of 15 males and six females with an average age of 35.7 years. All of them consecutively underwent conventional MRI, MR-arthrography finally followed by arthroscopy. The MRI and MR-arthrograms results were compared to the arthroscopy findings using the nonparametric Kappa test. Results.—To diagnose meniscal tears, statistical agreement measure for MRI with arthroscopy was good (K = 0.69) but not as good as the MR-arthrography/arthroscopy agreement which, by itself was excellent (K = 0.84). As a diagnosis tool, the sensitivity and specificity of MRarthrography (respectively 100 and 89.6%) were much higher than the corresponding values observed in conventional MRI (92.3 and 82.8%, respectively) which nonetheless remain satisfactory. Réflexions à partir de l’aide médicale apportée aux populations locales par les équipes chirurgicales du SSA déployées en opex. Ollat D, Marchaland JP, Versier G.
Les auteurs exposent les difficultés des équipes du Service de Santé des Armées en opération des équipes médico - chirurgicales dans l'aide médicale technique: Elles sont multifactorielles: géographiques, politiques, culturelles, environnementales et inhérentes aux conflits et aux forces en présence. Tumeur à cellule géante du coude: une localisation exceptionnelle. Mathieu L., Nader Y, Marchaland JP, Ollat, D., Barthelemy R., Versier G.
Is the Segond’s fracture a reliable sign of anterior cruciate ligament (ACL) tear? About a case report without associated ACL rupture. D. Ollat, J.P. Marchaland, L. Mathieu, O. Barbier, G. Versier. Segond's fracture is usually associated to ACL ruptures.The authors present a case of this fracture without ACL lesion. Stratégie thérapeutique initiale dans les pertes de substance distales du membre inférieur d'origine traumatique. À propos de 15 cas. Journal de traumatologie du sport. Les auteurs rapportent le cas d’une luxation de l’extenseur au dos de l’articulation métacarpo phalangienne du troisième doigt, liée à une rupture traumatique de la bandelette sagittale radiale du tendon. Un traitement chirurgical de première intention a été décidé afin d’optimiser la récupération fonctionnelle. Le résultat à six mois a été excellent et le patient a repris ses activités sportives, sans récidive de l’instabilité tendineuse. La fracture–avulsion du tubercule mineur huméral n’est pas rare. Cependant, elle est souvent méconnue ou diagnostiquée avec retard car la symptomatologie clinique est pauvre et peu spécifique. Les radiographies simples sont souvent d’interprétation difficile car le fragment fracturé se superpose avec la tête humérale. Le mécanisme traumatique est une mise en tension contrariée du tendon du muscle subscapulaire (rotation exagérée, abduction contrariée…). La luxation du tendon du long biceps est la principale lésion associée. Elle survient lorsque la fracture emporte la partie supérieure du tubercule mineur qui correspond à la poulie de réflexion de ce tendon. Le traitement peut être soit orthopédique (coude au corps en rotation interne), soit chirurgical s’il existe un déplacement fragmentaire. L’ostéosynthèse peut être soit un vissage direct, soit une ostéosuture. La voie d’abord est deltopectorale. Récemment, une ostéosuture avec des ancres par voie arthroscopique a été réalisée. En cas de luxation du tendon du long biceps, la ténotomie et/ou ténodèse semble donner de meilleurs résultats que le repositionnement du tendon dans sa gouttière. Comment faire un pansement aspiratif de type VAC sans matériel spécifique. OLLAT D., BARBIER O., MARCHALAND JP., VERSIER G.
Introduction : Les avantages des pansements aspiratifs de type VAC sont bien connus : réduction de la charge bactérienne et de l’oedème, favorisation du tissu de granulation et recouvrement cutané plus facile évitant une chirurgie cutanée plus compliquée. Tout cela est une aide précieuse en chirurgie en milieu précaire (notamment humanitaire) où les plaies surinfectées prises en charges tardivement associées à des pertes de cutanées étendues sont fréquentes. Cependant les dispositifs commerciaux sont rarement utilisés en raison de leur coût élevé. Dans ce cadre, nous proposons une technique originale de pansement aspiratif de type VAC réalisé avec des matériels non spécifiques, d’usage courant et de faible coût. Méthode : Nous proposons un pansement aspiratif réalisé avec des mousses d’éponges chirurgicales agrafées ensemble, si besoin, selon la surface nécessaire à couvrir. Un Redon multi perforé, placé dans l’épaisseur de la mousse, assure l’aspiration. L’étanchéité est obtenue par un film plastique adhésif stérile non spécifique. L’aspiration est obtenue soit par une aspiration électrique ou par un simple flacon de Redon. L’aspiration murale étant souvent inexistante en milieu chirurgical précaire. Résultats : Nous avons utilisé cette technique sur plus d’une trentaine de patients au Tchad dans le cadre de chirurgie exercée en condition précaire (aide humanitaire). Nous n’avons pas rapporté de complications particulières. Les résultats obtenus semblent comparables aux résultats obtenus avec des dispositifs commerciaux tant sur le plan septique que sur le plan du recouvrement cutané. Par contre il n’est pas possible de créer d’alternance dans l’aspiration. Ceci semble être le seul inconvénient notable par rapport aux dispositifs commerciaux. Conclusion : Au vu de notre expérience et des cas analogues relevés dans la littérature, nous pensons que cette technique de pansement aspiratif de type VAC réalisée avec des composants non spécifiques est une méthode sure et efficace. Nous espérons que l’utilisation de composants d’usage courant et de faible coût favorisera la diffusion de cette technique notamment en chirurgie exercée en milieu précaire (aide humanitaire, pays en voie de développement). The authors developed an original method, using tenodesis and anatomical repair, for the treatment of lateral chronic instability of the ankle in young military people. In this medium-term retrospective study, 32 patients were rewieved for functional and radiological evaluation. With a mean follow-up period of 20 months (range from six to 64 months), 90.6% (n = 29) of the patients were “satisfied” or “very satisfied”, 78.1% (n = 25) were painfree, but 15,6% (n = 5) complained about stiffness. Ninety-seven percent of them (n = 31) returned to athletic activity and no instability occured. The mean score for the Olerud and Molander Ankle Score was 91.5 (range from 70 to 100). On postoperative stress radiographs the mean side-to-side talar tilt difference was 0.6 ± 2.9°. The mean loosening of eversion isometric strength on the ankle operated was 5.4%. The present study demonstrates that this mixed procedure give excellent results in terms of stability, despite of a well-tolerated stiffness. Traitement chirurgical de l’hallux valgus par ostéotomie métatarsienne. A propos de 85 pieds. J.P. Marchaland, X. Bajard, D. Ollat, G. Versier. Introduction : Les auteurs présentent les résultats d’une étude incluant 69 patients (85 pieds) opérés par ostéotomie métatarsienne (Scarf ou chevron) associée à une ostéotomie phalangienne entre 2004 et 2005. Matériel et méthode : Il s’agit d’une étude rétrospective. On compte 58 femmes pour 11 hommes avec un age moyen de 57 ans. L’hallux-valgus moyen est de 33° et le métatarsus varus de 15°. Tous les patients avaient des douleurs sur le bunion et des difficultés au chaussage. Tous les patients étaient revus avec des radiographies en charge, une incidence de guntz et des sésamoïdes. Ceci permettait de mesurer le métatarsus varus, l’hallux-valgus, le DMAA, le DM2AA, le PPAA et d’évaluer la position de sésamoïdes. L’évaluation clinique était basée sur le score de groulier. Résultats : Tous les patients étaient revus avec un recul moyen de 21 mois. 81 % des patients étaient satisfaits ou très satisfaits. Le résultat objectif était bon ou très bon dans 83,6% des cas. Une relation était établie entre les résultats cliniques et la correction de l’angle métatarso-phalangien (M1P1), l’angle intermétatarsien (M1M2), la déviation de la surface articulaire distale du premier métatarse (DMAA), la déviation de la surface articulaire distale du premier métatarse par rapport au second (DM2AA), et la déviation de la surface articulaire proximale de P1 (PPAA). On recensa 15% de complication (défaut de correction, hématome et sepsis superficiel). Deux patients furent réopérés pour un hallux varus. Les mauvais résultats anatomiques, et le score de Groulier étaient corrélés au résultat subjectif. Discussion : Nos résultats étaient comparables à ceux de la littérature. Le score de Groulier donnait une bonne évaluation objective du résultat, prenant en compte les données radiologiques et anatomiques qui influencent le résultat final en cas d’insuffisance de correction. La correction du DM2AA était fondamentale pour obtenir un bon résultat anatomique. Conclusion : La chirurgie de l’hallux-valgus doit rester une chirurgie fonctionnelle et non esthétique. Par ailleurs, la déformation du reste de l’avant-pied doit être planifiée dans la prise en charge thérapeutique, car elle affecte le résultat final. Mots clefs : Hallux-valgus, ostéotomie métatarsienne, DM2AA, Scarf, chevron. Surgical treatment of hallux valgus by metatarsal osteotomy. About 85 feet.
. P. Marchaland, A. Duhoux, X. Bajard, D. Ollat, G. Versier. Introduction : The authors present the results of surgery for hallux-valgus in 69 patients (85 feet) by metatarsal osteotomy (Scarf, rafter or basal osteotomy) associated with phalangeal osteotomy in 2004 and 2005. Material Methods : In this retrospective study of 58 female and 11 male middle-aged patients (mean age 57 years) the hallux-valgus was 33° on average and the metatarsus varus 15°. All the patients had pains on the bunion and difficulty in wearing shoes. The patients were reviewed with x-rays of the both feet with weight bearing and a Guntz view of sesamoid bones. It permitted the measure of metatarsus varus, hallux-valgus, DMAA, DM2AA, PPAA and to evaluate the position of sesamoid bones. The clinical evaluation was based on the Groulier scoring system. Results : In the average follow-up time of 21 months, 81% of the patients were satisfied or very satisfied. The objective result was good or very good in 83,6%. There was an interrelationship between the clinical results and the correction of the metatarso phalangeal angle (M1P1), the inter metatarsal angle (M1M2), the distal metatarsal articular angle (DMAA), the distal articular angle of M1 in relation to M2 (DM2AA) and the proximal phalangeal articular angle. 15% of patients had complications (scars disorders, hematoma, and superficial sepsis). 2 patients were re-operated for an iatrogenic hallux varus. The bad anatomic results and the Groulier score were correlated with the subjective results. Discussion: Our results are comparable with those described in the literature. The Groulier scoring system gives a good objective evaluation of the results since it takes into account of radiological anatomical data that affects the final result in case of insufficiency or loss of correction. The correction of the DM2AA is fundamental in order to have a good anatomical result. Conclusion: The surgery of the hallux-valgus must remain a functional and non aesthetic surgery. It must be made however before the appearance of distortions on the rest of the fore foot, because it affects the final result. Problèmes de couverture osseuse dans les traumatismes ouverts complexes du pied. Les auteurs se proposent de traiter des traumatismes ouverts complexes du pied correspondant à l’association de lésions osseuses multiples et/ou comminutives avec atteinte des parties molles de stade III de Gustilo. Les circonstances de survenue sont le plus souvent des traumatismes à haute énergie : accidents de la voie publique et plaies de guerre. Le traitement réside en la lutte anti-infectieuse par parages itératifs voir amputations, la prévention et la correction de déformations irréductibles par ostéosynthèse extra focale. La couverture quant à elle intervient au mieux dans les 72 premières heures et au plus tard dans les 4 à 6 jours. Elle s’effectue essentiellement par cicatrisation dirigée en pression négative ou lambeaux à pédicule distal de flux rétrograde. Malgré un traitement adéquat, les séquelles fonctionnelles restent importantes et les éventuels temps de reconstruction secondaires difficiles sur des tissus très fragilisés. Marchaland JP., Mathieu L., Ollat D., Barbier O., Versier G.
Breda R., Marchaland JP., Ollat D., Versier G.
Introduction : Les ostéochondrites disséquantes du condyle fémoral se définissent comme des séquestres ostéochondraux. Il s’agit d’une pathologie rare dont le traitement peut être chirurgical. Dans l’arsenal thérapeutique, l’autogreffe chondrale en mosaïque est une technique des plus récentes. L’objet de ce travail était d’évaluer les résultats à moyen et long terme d’une série de douze cas traités par mosaïc plasty. Matériel, méthode : Il s’agit d’une série rétrospective comportant 12 patients d’âge moyen 24,5 ans opéré selon la technique décrite par Hangody. La durée d’immobilisation moyenne a été de 5,5 semaines. La reprise sportive s’est effectuée à la 29ième semaine. Quatre n’ont pas repris le sport. Aucun patient n’a présenté de complications. Pour la méthode de révision, les patients ont bénéficiés d’une arthro IRM, ou d’une IRM, de radiographies et pour un seul d’une arthroscopie. Le but de ces examens était de noter le niveau de couverture et d’intégration des différents greffons. Résultat : Le recul moyen à la révision était de 4,3 ans. Les résultats cliniques sont bons à excellents dans 60% des cas. Les résultats radiologiques sont bons à excellents dans 8 cas. L’analyse des résultats n’a pas montré de concordance entre les résultats clinique et radiologique, ni entre le volume de la lésion initiale et le résultat, ni entre la qualité du résultat et le taux de couverture ou le stade évolutif initial. La localisation n’influe pas sur le résultat.. Par contre, l’analyse des résultats a montré une tendance significative entre la qualité du résultat et l’âge. L’analyse des résultats n’a pas montré une corrélation entre le nombre de greffons et la qualité du résultat. Les analyses statistiques n’ont pas montré que les lésions isolées sans gestes associés donnaient un meilleur résultat que celles associées à un geste chirurgical ni de corrélation entre le résultat clinique et le comblement de l’espace. Discussion : Les résultats de notre série retrouvent 60% de résultats satisfaisant à 4,3 ans de recul selon le score ICRS. Nos résultats sont conformes à ceux de la littérature. D’autres auteurs rapportent des résultats différents. Les résultats entre les différentes études dépendent de la sélection de patients (âge moyen/ taille de la lésion/ origine traumatique). Ces données sont retrouvées dans toutes les études. Les résultats concernant la localisation retrouvés dans notre étude, sont comparables avec d’autres séries. L’analyse des résultats n’a pas montré une corrélation entre stade évolutif initial et le résultat ainsi qu’entre le volume de la lésion initiale et le résultat. Ces résultats sont retrouvés dans d’autre série. Les résultats statistiques n’ont pas montré de concordance entre le nombre de greffons et la qualité du résultat. Par contre, d’autres études retrouvent une relation . Les résultats d’autres études ont montré que les gestes isolés, c’est à dire sans autres gestes associés autre que l’OCD, donnaient de bien meilleurs résultats. Nos résultats, comme d’autres études, ne retrouvent pas de concordance. La durée moyenne d’immobilisation a été de 6 semaines. Certains auteurs proposaient une durée variable (entre 6 et 24 semaines). Conclusion : Le traitement des ostéochondrites du condyle fémoral de l’adulte par greffe ostéochondrale en mosaïque donne des résultats satisfaisant dans 60% des cas, ce qui corrobore les résultats dans la littérature à court et à moyen terme. Cette technique minutieuse et délicate doit être privilégiée pour le condyle interne des sujets jeunes, avec un comblement optimal de la perte de substance. On observe souvent un meilleur résultat clinique que radiologique ce qui pourrait compromettre à long terme la qualité du résultat. Kystes paraglénoidiens gleno-huméraux à propos de 6 cas et revue de la littérature. Il s’agit d’une série rétrospective de 6 cas de kystes para-glénoïdiens gléno-huméraux présentant l’intérêt d’être tous différents offrant ainsi une description relativement complète et représentative de cette pathologie. Il ressort de la revue de la littérature que cette pathologie est maintenant bien analysée. Elle n’est pas rare avec une incidence de 2 à 4 % dans la population générale. La lésion du bourrelet glénoidien est reconnue comme étant l’étiologie des kystes. La physiopathologie du kyste est similaire à celle des kystes méniscaux. La complication la plus fréquente est la compression du nerf supra-scapulaire. L’IRM est l’examen para-clinique de référence. L’arthroscopie permet un geste thérapeutique complet avec évacuation du kyste et réparation du bourrelet. L’arthroscopie a une morbidité très inférieure à la chirurgie conventionnelle. Elle est devenue le traitement chirurgical de référence. Mots clés : Épaule, kyste paraglénoidien, arthroscopie. How to cover losses of soft tissue in bone infection after war injuries of the leg? Military Field Hospital of Kabul (Afghanistan). J. P. Marchaland, V. Ivanov, M. Dorfmuller, D. Vogt, A. Hamm, P. Aubert, G. Versier. Introduction: The authors announce their experience about the covering of bone infection after war injuries of the leg. This multinational team composed of French, German and Bulgarian orthopaedic surgeons exhibit 12 cases of patients operated at the field hospital of Kabul (Afghanistan). Material and method: Between may and august 2007, 12 patients (only men), with bone infection of the leg and tissue lesions (either fistula or loss of substance) were managed in our field hospital. The initial traumatism was a wound by shrapnel of shell, grenade or mortar and bullets. The first treatment consisted in a debridement, washing and external fixation. The loss of tissue was in five times on the third or medium part of the leg and in four times on the third distal part of the leg. Then, we made the flap, after a previous look two days after, consisting in a new debridement. We made 4 musculo cutaneous flaps with medial gastrocnemius, 3 medial gastrocnemius muscular flaps, one lateral gastrocnemius muscular flap and 4 fascio cutaneous flaps for distal lesions. After surgery, dressings were made each two or three days. Results: The cicatrisation was complete for all the patients in an average of 25 days. One patient with a fascio cutaneous flap had a necrosis of the distal part of the flap; it benefitted of a controlled cicatrization. The time of hospitalisation was about 10 days. Discussion: In isolated situation or in situation of war, the treatment of bone infection must be simple. The management of this war aftermath is limited by several factors which make the treatment very difficult: the insecurity, the deficiency and the time of transportation, the length of the antibiotherapy, the necessity to have a short hospitalization and sometimes the difficulty to find a germ, in our structure whose main mission is to treat war injuries in ISAF (NATO) soldiers. The cover by flap after soft tissues and bone debridement permits to give a new vascularized tissue on the losses of substance. Its anti infectious property is undeniable. The indications are classic: muscular or musculo - cutaneous flaps for the third superior and the middle part of the leg and fascio - cutaneous flaps for the middle and the third distal part. Conclusion: The flap is a first essential treatment to fight against the infection especially in case of limited technical and medicinal means. This simple and reliable technique has got a lot of indications in war surgery. Les auteurs font part de leur expérience dans la couverture des pertes de substance des parties molles de la jambe en situation précaire ou isolée face à des lésions de guerre ou des séquelles d’accident de la route. Le peu de moyens techniques (absence de VAC®), la lenteur et le coût de la cicatrisation dirigée et de l’antibiothérapie, la nécessité d’hospitalisation courte dans des structures pas toujours adaptées, conduit à la réalisation de lambeaux de couverture. Ces techniques simples et fiables permettent à au chirurgien orthopédiste généraliste de faire face à des situations parfois difficiles en particulier dans la lutte anti infectieuse. Les indications sont classiques : lambeaux musculaires ou musculo- cutanés pour la moitié et le tiers proximal de jambe et les lambeaux fascio cutanés pour la moitié et le tiers distal. Congrès des sociétés latines de chirurgie . Marseille 2007. Plaidoyer pour dissocier le sub-scapularis dans les butées coracoïdiennes pour instabilité antérieure de l'épaule. JP. Marchaland, L. Mathieu, A. Bouchard, Y. Nader, Ch. Bures, G. Versier. Le but de ce travail est de comparer le retentissement anatomique et fonctionnel sur le muscle sub scapulaire après abord horizontal par clivage des fibres comme le préconise Walch ou par section en L inversé. Un procédé original de fixation fémorale des tendons de la patte d’oie (DIDT) dans les ruptures du ligament croisé antérieur. Le but de cette étude était d’évaluer les résultats du DIDT à quatre faisceaux sous arthroscopie, avec tunnel transcondylien, en utilisant le QuidnoviR (Phusis). Ce dispositif tronconique fait corps avec les quatre brins en proximal et se bloque dans le tunnel condylien externe, lors du passage de dehors en dedans, la fixation distale étant confiée à une vis résorbable (TenoscrewR de Phusis). 60 patients opérés ont été revus cliniquement et radiologiquement, selon les critères IKDC avec un recul minimal de 1 an. 33 IRM avec le même protocole ont ainsi été réalisées. Les résultats cliniques montrent une laxité différentielle moyenne postopératoire de 1,7 mm au rollimeterR, 87 % de score A ou B dans la cotation IKDC avec des douleurs ne dépassant pas 1 sur 10 sur l'échelle EVA à l'effort, aucun dérobement à la reprise du sport en pivot. Sur les 60 patients, 2 complications ont été notées : 1 algoneurodystrophie et 1 arthrite abactérienne. Conformément à la littérature, les suites post-opératoires ont été plus simples, les douleurs moins fréquentes et importantes qu’après l’utilisation de tendon rotulien, la laxité résiduelle discrètement plus importante pour un résultat fonctionnel identique et une récupération musculaire meilleure. Les données de l'imagerie objective un positionnement correct constant du tunnel fémoral, un transplant intact et de calibre régulier. Le bloqueur fémoral est en position cortico-spongieuse dans la majorité des cas. La longueur de transplant libre, d’un point de fixation à l'autre, est en moyenne de 60 mm. Aucune corrélation clinique n’a été retrouvée entre la valeur de cette longueur, la laxité résiduelle ou le score IKDC (p> 0,05). Par ailleurs, le phénomène de balayage du tunnel (bungee effect) observée dans 5 cas n’a eu aucune incidence sur le résultat. Le QuidnoviR simplifie le verrouillage fémoral sans compliquer la préparation du transplant. À un an, cette technique fiable et reproductible donne de bons résultats sur la laxité. Couplée à une rééducation non accélérée, elle permet la reprise des activités sportives au même niveau. Actuellement, nous utilisons cette technique de manière exclusive dans toutes les indications de greffe du LCA. JP. Marchaland, S. Bonnet, M.Levadoux, Ch. Bures, G. Versier. L'ulcère de Buruli est une infection à Mycobacterium Ulcerans entraînant une nécrose du tissu sous- cutané. Presque aussi fréquente que la Tuberculose , elle représente un poids social et économique important en raison du traitement long et onéreux. Le traitement médical est aléatoire laissant place à une chirurgie qui doit être "carcinologique". En situation isolée, la prise en charge lourde est difficile comme en témoigne l'expérience les auteurs. Prise en charge chirurgicale des pieds de ponts. A propos d’une série lors de l’attentat de Karachi. J.P. Marchaland, A. Bouchard, L. N’Guyen, M. Le Bars, J.M. Martin, F.X. Gunepin, G. Versier, S. Rigal. Le pied de pont se définit comme l’ensemble des lésions osseuses, des parties molles et vasculo- nerveuses causées par un engin explosif dont l’énergie est transmise au pied à travers une interface solide : c’est le « solid blast » des auteurs anglo- saxons. Les lésions retrouvées sont équivalentes à celle du pied de mine fermé. L’agent vulnérant peut être une mine antipersonnelle, anti- char ou sous- marine explosant au passage du véhicule ou du bateau, voire une voiture piégée contre un autre véhicule comme à Karachi. Pour ne s’intéresser qu’à l’appareil locomoteur, l’énergie libérée par l’explosion au travers de l’interface solide est transmise au pied et aux segments de membre sus- jacents donnant des lésions étagées mais aussi d’autres atteintes notamment au niveau des mains si celles- ci étaient en contact avec l’interface solide. La principale caractéristique de ces lésions est leur caractère fermé initialement et la faible incidence voire l’absence de polycriblages. A partir de notre expérience de l’attentat à la bombe de Karachi en mai 2002, nous exposons les résultats du traitement et nos réflexions à propos d’une série de 20 pieds de ponts simultanés chez 11 blessés. Les suites post- opératoires ont principalement été marquées par des complications pour 70% des patients. Les complications septiques et cicatricielles en représentaient 50%. La prise en charge du pied de pont reste un challenge thérapeutique ; l’optimisation du traitement passe par un bilan complet notamment tomodensitométrique, mais surtout local en raison du risque important de troubles cicatriciel et d’ostéite. Les séquelles fonctionnelles restent importantes mais le retentissement psychologique de cet attentat est au premier plan. Purpose: We report the satisfactory results obtained in a retrospecive multicentric series of 80 shoulder prostheses implanted for aseptic osetonecrosis of the head of the humerus. Material and methods: Seventy-four patients (43 men, 31 women, men age 59 years) with aseptic osteonecrosis of the head of the humerus treated with a shoulder prosthesis were reviewed at least two years after surgery. The mean weighted score before surgery was 37%. Twenty-six total prostheses and 54 humeral prostheses were implanted via the deltopectoral approach. There had been few complications at review: seven stiff shoulders, one torn suture of the subscapularis with instability, two inflammatory glenoids. one migration. Physical exam and x-ray (ossifications, lucent lines) findings were recorded. Results: Mean follow-up was 47 months (24-104 months). The Constant score was improved significantly (p Discussion: A humeral prosthesis should be preferred for grade II-III shoulders and a total shoulder arthroplasty for major degeneration of the glenoid (grade V). For grade IV. either prosthesis may he used depending on the patient's age, activity level, and status of the rotator cuff. For very young or very old patients, high levels of physical activity may argue against prosthesis implantation due to the risk of loosening or rotator cuff tears which are unfavourable factors. Conclusion: The results of this multicentric series corroborate data in the literature that shoulder arthroplasty provides good results for the treatment of aseptic necrosis of the head of the humerus. In generally, arthroplasty allows pain relief, good motion, particularly for external rotation, and good force recovery, explaining the better results obtained in active younger subjects. Les auteurs présentent les résultats du traitement de l'instabilité antérieure chronique gléno - humérale par butée coracoïdienne d'une série de 70 patients. Aspect cliniques et thérapeutiques de l'ulcére de Buruli au membre supérieur. L'ulcère de Buruli est une cellulite chronique sous-cutanée évoluant spontanément vers l'ulcération. Provoquée par Mycobacterium ulcerans, elle se développe en milieu intertropical surtout en Afrique. Maladie de la pauvreté elle sévit en zone agricole humide. L'exode des populations face à la guerre favorise la propagation de la maladie. En l'absence de traitement médical efficace et d'un coût accessible pour une population pauvre seule la chirurgie peut guérir ces patients. De novembre 2002 à Janvier 2004 plus de 100 lésions de Buruli ont été prises en charge au sein de l'hôpital de Kokumbo en périphérie de Yamousoucro en Côte-d'Ivoire. Sur ces 100 lésions 40 étaient développées au membre supérieur : 20 au bras et à l'épaule, cinq au coude, dix à l'avant-bras et cinq au poignet. Aucune lésion n'a été notée purement à la main. Le traitement a essentiellement consisté en une mise à plat chirurgicale des lésions, les relais par des soins locaux puis des greffes cutanées fines. Malgré un protocole de greffe différé de nombreuses récidives ont été notées. L'ulcère de Buruli existe depuis de nombreuses années en Côte-d'Ivoire. Jusqu'en septembre 2002 on rencontrait des cas sporadiques en périphérie de Yamoussoukro. Depuis le début de la guerre, la fuite des habitants de l'ouest vers le centre du pays a multiplié le nombre de cas. L'atteinte est multiple et peut prendre l'aspect de nodules, de petites ulcérations circonscrites ou de vastes cratères surinfectés. En absence de traitement médical efficace les soins locaux puis les greffes de peau permettent seuls une guérison des lésions. Le peu de ressource des populations les plus touchées rend illusoire tout traitement coûteux. Dans ce contexte il nous est apparu que l'application locale de Dakin (facile à réaliser et peu coûteux) en alternance avec du miel sauvage (toujours disponible en brousse) constituait une bonne alternative. En outre c'est une excellente méthode pour obtenir un lit de greffe propre et bien vascularisé en peu de temps. Plusieurs patients ont pu bénéficier de ce protocole. L'ulcère de Buruli est une maladie de la pauvreté. L'atteinte au membre supérieur est fréquente rendant la population touchée en majorité agraire encore plus fragile et vulnérable. L'utilisation de la liqueur de Dakin et du miel sauvage permet d'accélérer la détersion et d'obtenir une cicatrisation rapide. L'abord du subscapularis dans les butées coracoïdiennes. Etude rétrospective de 70 cas. J-P. Marchaland, C. Bures, G. Versier, M. Danguy des Déserts, S. Rigal. Les auteurs exposent les résultats à 2 ans des butées coracoïdiennes réalisées chez 70 patients en comparant l'abord par section du subscapulaire et l'abord par clivage de ses fibres. Orthopédie et traumatologie, collection « Réussir l’internat », éditions Ellipses. Les lésions méniscales représentent des atteintes méniscales internes ou externes, d’origine traumatique ou dégénérative. L’IRM a permis de diminuer les arthroscopies diagnostiques abusives. La traitement dépend du type de lésion mais aussi du contexte (âge, état ligamentaire et cartilagineux). Ce n’est plus la méniscectomie totale comme on le pratiquait systématiquement, il y a quelques années encore mais l’économie (abstention, méniscectomie partielle ou réparation) car la suppression de cet amortisseur fait le lit de l’arthrose. Cette chirurgie se fait sous arthroscopie, permettant un bilan lésionnel méniscal, ligamentaire et cartilagineux. Il peut être parfois nécessaire de réaliser une courte arthrotomie en particulier pour les réinsertions méniscales. Les suites sont habituellement simples permettant au patient l’appui et la mobilisation immédiate, une reprise du travail au 15è jour et la reprise du sport 1 mois après; en cas de suture ou de réinsertion méniscale, la récupération des amplitudes articulaires est limitée pendant un mois, afin de ne pas engager la corne postérieure sous le condyle ; par contre l’appui est autorisé immédiatement. Lésions ligamentaires du genou et de la cheville. J.P. Marchaland, G. Versier, R. Barthélemy. Les lésions ligamentaires du genou intéressent les ligaments croisés dont la rupture traumatique peut être isolée ou associée à celle des formations périphériques du genou. Il faut distinguer : - les lésions ligamentaires récentes qui surviennent dans le cadre d’«entorse grave» du genou. - les lésions ligamentaires anciennes responsables d’une laxité chronique avec ou sans « instabilité chronique », évolution spontanée d’une entorse grave, source à long terme de gonarthrose. Sont exclues de ce propos, les lésions ligamentaires bénignes qui ne concernent pas les ligaments croisés. Elles concernent essentiellement le ligament latéral interne qui ne laisse pas persister de laxité résiduelle et ne pose que peu de problèmes thérapeutiques (attelle antalgique et rééducation). Nous évoquerons les pentades et les luxations dont le traitement complexe et controversé ne sera pas détaillé. La pathologie ligamentaire du genou touche de préférence le sportif; le ligament croisé antérieur (LCA) est le plus souvent concerné. Fractures de la palette humérale chez l’enfant. J.P. Marchaland, G. Versier, C. Serra, G. Bollini, J.L. Jouve, R. Barthélemy. On peut les définir comme une solution de continuité extra- articulaire et/ ou articulaire, en zone osseuse et/ ou cartilagineuse de l'extrémité distale de l'humérus. Elles s'inscrivent dans les fractures du coude qui sont caractérisées par leur fréquence puisqu'elles représentent 10 à 25% des traumatismes de l'enfant, soit 12 à 16% des fractures et surtout leur gravité car elles sont suivies de 25% de séquelles. Elles nécessitent donc un démembrement anatomique exact, pour instaurer un traitement urgent et adapté. Les fractures de la palette humérale sont des fractures graves représentées essentiellement par les fractures supra condyliennes, du condyle latéral et de l’épicondyle médial. Le diagnostic est le plus souvent radiographique ; cependant, il faut parfois s’aider de l’arthrographie en particulier chez le petit enfant. Elles nécessitent une prise en charge urgente par un traitement bien codifié pour prévenir des complications et des séquelles fonctionnelles parfois très lourdes. Infections aigues des parties molles (panaris, phlegmon, abcès). Discision ou section du muscle subscapularis dans la butée coracoïdienne. Comparaison clinique et tomodensitométrique à court terme. A propos de 70 cas. Marchaland JP., Bures C., Versier G., Danguy des Déserts M., Rigal S.
Les auteurs comparent les résultats des butées coracoïdienne d'épaule par une étude radio - clinique rétrospective non randomisée ouverte. Lésions bi croisées : analyse critique d’une série multicentrique de l’ESSKA. Versier G., Marchaland JP , Bures Ch., Rongieras F. , Neyret Ph. Les lésions bi croisées du genou sont des lésions rares. La priorité doit aller au bilan vasculaire car on connaît la fréquence et la gravité des lésions de l’artère poplitée. Le bilan lésionnel ligamentaire repose su la clinique, la radiographie et l’angio IRM. Le but du traitement chirurgical est d’annuler la translation tibiale postérieure ; il utilise soit une reconstruction primaire ou une suture associée à un renforcement du LCP, soit une double ligamentoplastie en urgence différée plus stabilisante mais plus enraidissante. L’évolution arthrogène est importante (43% des patients après 10 ans de recul), surtout après luxation, du fait des lésions ostéochondrales et méniscales associées. Le pronostic est loin d’être catastrophique, ce qui correspond à une adaptabilité fonctionnelle et à une diminution des ambitions sportives et physiques avec le recul. Résultats des acromioplasties arthroscopiques. Etude clinique et radiographique de 47 patients. La chirurgie arthroscopique de l’espace sous acromial est un traitement recouvrant un grand nombre de pathologies. Les indications concernent le plus souvent les tendinopathies calcifiantes, les tendinopathies non calcifiantes, les ruptures partielles ou totales de la coiffe des rotateurs, voire l’arthropathie acromio- claviculaire. Le but de cette étude rétrospective est d’évaluer les résultats des acromioplasties arthroscopiques chez 47 patients présentant un syndrome douloureux sous- acromial. La migration intracardiaque d’un plomb d’arme à feu à partir d’un tronc veineux périphérique est très rare. Elle est facilitée par la taille et le nombre lors de l’impact, comme c’est le cas pour la grenaille ; ce passage est asymptomatique et peut se faire jusqu’à 15 ans après la blessure. Plusieurs problèmes doivent être évoqués : le mécanisme de son passage dans le cœur (vitesse propre et retour veineux), le diagnostic topographique (radiographie pulmonaire, échographie transthoracique, transœsophagienne et tomodensitométrie), les conséquences locales de ce projectile (érosion locale, caillotage, endocardite), la destination possible d’une nouvelle migration (embolie pulmonaire, cœur gauche), les indications d’extraction, la surveillance. L’extraction ne doit pas être systématique, mais uniquement en cas de foramen ovale rendant possible une embolisation systémique aux conséquences cliniques gravissimes ou en cas de complications. Les auteurs rapportent l’observation d’un patient de 22 ans pour lequel ils ont choisi abstention et surveillance. We reviewed 2 sets of patients treated by coracoid abutment for shoulder anterior instability (31 patients, subscapularis section, 39 patients, split). Subscapularis section generate fatty degeneration (p<0,005), which causes muscular weakness feeling (p<0,04), confirmed by dynamometric measures (p<0,004), medial rotation fall (p<0,007) and bad results (p<0,002). We explain degeneration by neurovascular lesions and fall of physical training. Consequence is reduction of subscapularis function (clinical weakness, medial rotation). It causes muscular unbalance in favour of lateral rotators which risk to be over prompted. Unbalance could be the origin of cuff tendinopathy and posterior glenohumeral subluxation responsible for arthritis at middle course. Traitement chirurgical des lésions ostéochondrales du dôme astragalien. G. Versier, J.P. Marchaland, Ch. Bures, B. Bauer, P. Christel. Traiter chirurgicalement une lésion cartilagineuse post-traumatique ou sur ostéochondrite nécessite une évaluation première clinique et para clinique afin de définir l’importance de la gène fonctionnelle, la taille et la profondeur de la lésion, sa localisation en surface portante, et les conditions biomécaniques au niveau de cette lésion. D’une manière générale, la lésion doit être de grade III et IV de la classification de l’International Cartilage Repair Society, en zone portante, sur une articulation stable et axée et chez un sujet de moins de 50 ans. Les auteurs rappellent les différentes techniques actuellement disponibles, parmi lesquelles on retiendra la stimulation sous- chondrale par micro fractures qui donne une réparation ostéo fibreuse, les techniques de réparation par culture cellulaire de chondrocytes autologues et de greffes ostéochondrales autologues en mosaïque qui ont pour objectif d’amener du cartilage hyalin. Les indications actuelles, basées sur les données récentes de la littérature, sont précisées au genou et à la cheville, fonction de la taille et de la localisation, avec la nécessité au dôme astragalien de réaliser le plus souvent une ostéotomie malléolaire y compris pour la malléole externe afin d’accéder aux lésions externes du dôme. Ostéonécrose avasculaire aseptique de la tête humérale : résultats cliniques et radiologiques des prothèses d’épaule. Les auteurs rapportent les résultats satisfaisants d’une série multicentrique rétrospective de 80 prothèses d’épaule pour ostéonécrose aseptique de la tête humérale. Résultats des prothèses d’épaule après chirurgie de la coiffe des rotateurs. G. Versier, J.P. Marchaland, Ch. Bures. La chirurgie de l'espace sous acromial avant prothèse d'épaule est connue pour être source de raideur et de moins bons résultats. Le but de notre étude est d'évaluer le résultat de l'arthroplastie après chirurgie de l'espace sous acromial. L'arthroplastie d'épaule après chirurgie de l'espace sous acromial a le même pronostic qu'en l'absence de chirurgie préalable, dans chaque groupe étiologique sauf en cas arthrose avec rupture massive de coiffe; pour ces patients un geste chirurgical avant la prothèse diminue considérablement la mobilité surtout en cas d'échec de réparation de la coiffe, qui a été à l’origine d’une excentration de la prothèse. L’acromioplastie préalable ne péjore pas le résultat de la prothèse, en particulier quand l’indication est une arthrose primitive. Les résultats des prothèses d’épaule après chirurgie de l’espace sous acromial sont globalement satisfaisants; l’existence d’une épaule pseudo paralytique après réparation initiale de coiffe est une source d’échec pour l’arthroplastie car elle a conduit dans notre série à une reprise par prothèse inversée. Utilisation de substituts osseux dans les ostéotomies tibiales hautes de valgisation par addition interne. À propos de 21 cas. M. Lebars, J.P. Marchaland, G. Versier, F. Esling, B. Tramond, C. Savornin. L'utilisation de substituts osseux dans les ostéotomies tibiales de valgisation par ouverture interne est une technique encore récente. Le faible recul actuel de leur utilisation ne doit pas minimiser la qualité des résultats obtenus, tout à fait comparables à ceux des autres options : ils sont, sur le plan clinique, très satisfaisants à un an de recul. Leur biocompatibilité, leurs propriétés mécaniques initiales sont excellentes, permettant d'assurer, par leur hauteur variable, la correction angulaire désirée. L'analyse radiographique montre toutefois une ostéo intégration trop rarement complète au bout d'un an. Ces résultats demandent une réévaluation plus tardive qui ne remet pas en cause la poursuite de leur utilisation. La mise au point de substituts à intégration plus rapide serait une voie de recherche intéressante. Marchaland JP., Bures C., Versier G., Rigal S., Di Schino M., Savornin C.
Les auteurs exposent les complications d'une série rétrospective de 70 patients opérés d'une butée coracoïdienne pour instabilité chronique de l'épaule.Seules les complications spécifiques liées à la butée et la voie d'abord altèrent le résultat final sans récidive de luxation mal gré une appréhension persistante. Bures C., Marchaland J-P., Versier G., Rigal S.
Les auteurs exposent les complications spécifiques (abord, technique) et non spécifiques des butées coracoïdiennes. Chondrome extra squelettique du creux poplité. A propos d'un cas. Marchaland JP., Fabre A., Claude V., Schiele P., Maontaigut JY., Branfaux M., Di Schino M.
Les auteurs présentent une observation de chondrome para - articulaire du creux poplité chez un patient de 40 ans. Cette tumeur est apparue chez un patient sportif sous la forme d'un kyste poplité responsable de douleurs mécaniques depuis 2 ans. C'est une tumeur bénigne et rare dont l'exérèse se fait par voie de Trickey. Aucun cas de dégénérescence maligne n'a été décrite. La perforation d’un diverticule du colon droit est rare, c’est la raison pour laquelle le diagnostic est rarement évoqué en présence d’un tableau douloureux du flanc droit, souvent pris pour un syndrome appendiculaire. La tomodensitométrie abdominale est un bon examen d’orientation diagnostique. En cas de doute, la coelioscopie à visée diagnostique permet habituellement de faire le diagnostic et doit être convertie en laparotomie dans le but de réaliser une colectomie segmentaire avec si possible rétablissement de la continuité colique. Traitement chirurgical des lésions du ligament croisé antérieur du genou par plastie mixte autologue. Objectif Afin d'évaluer les résultats cliniques et radiologiques des ligamentoplasties par transplant libre antérieur, 53 patients ont été revus avec un recul minimal de huit ans. Méthode Tous les patients étaient sportifs dont 19 en compétition. Lors de la révision, tous les opérés ont bénéficié d'un interrogatoire selon les fiches Arpege-Clas et Lysholm-Tegner et d'un examen clinique complet. Un bilan radiographique en appui monopodal a permis d'apprécier l'arthrose et la translation tibiale antérieure résiduelle. Résultats Soixante et onze pour cent des patients obtiennent un résultat fonctionnel global excellent ou bon, 21% moyen et 8% mauvais. L'examen clinique n'objective aucun ressaut vrai et 17% de ?ressauts bâtards?. Les radiographies montrent 25% d'arthrose. Cette modification radiologique, le plus souvent fémorotibiale interne, est hautement liée à l'âge du patient au moment de l'intervention, au délai opératoire et à la méniscectomie interne. La subluxation tibiale antérieure différentielle moyenne est de 1,5 ± 2,3 mm. Conclusion Nous exposons nos indications chirurgicales depuis janvier 1990 dictées par le caractère très délabrant de cette intervention et des douleurs attribuées à un syndrome fémoropatellaire dans 64% des cas, à la décortication du surtout fibreux prérotulien, à la plastie du vaste interne pratiquée systématiquement au début de notre expérience et à de possibles erreurs de rééducation. Fracture de l'apophyse coracoïde. A propos d'une observation. Marchaland JP., Versier G., Bauer B., Romanet JP., Savornin C.
Les auteurs exposent une forme anatomo - pathologique originale de disjonction acromio - claviculaire. Injuries of the lower extremities caused by the explosion of antipersonal mines. S. Rigal, G. Dalzotto, J.P. Marchaland, M. Branfaux, P. Tripon. The purpose of this study was to evaluate the treatment of the injuries of the lower extremities caused by land mines. Classically, “mine foot” designated an entity which associated bone and neurovascular damage but with skin integrity. We outline the most frequent direct mechanism involves extensive skin injuries, the increasing wounding power of explosive devices causes frequent bilateral and delimited injuries in a context of distant multipenetrating wounds far from the foot and associated with high rate of lethality. Our study highlights the necessity of emergency treatment of these soldiers near the battlefield to improve the result of conservative treatment. Laxité antérieure du genou. "Technique de Mac In Jones Modifiée". Les auteurs rapportent les résultats d'une étude rétrospective avec révision clinique et radiologique de 53 patients opérés par ligamentoplastie mixte pour rupture du LCA à l'Hôpital d'Instruction des Armées Desgenettes de Lyon avec un recul de 8 ans. Il s'agit d'une publication faisant suite à une thèse présentée en 1994. Cicatrisation des moignons d'amputation pour cause vasculaire. P. Szymczyszyn, M. Deligny, JP. Marchaland, JL. André. Amputation traumatique du membre supérieur. Technique de cicatrisation dirigée. M. Deligny, P. Szymczyszyn, JP. Marchaland, JL. André.